Which Blueberry Bush Grows Best in Zone 7? Is There an Evergreen Blueberry Plant? What Fertilizer for Blueberry Plants? Japanese blueberry, known botanically as elaeocarpus decipiens, is an species of flowering and fruiting evergreen shrub in the malvales order of plants which includes hibiscus, cacao and linden trees. Japanese blueberry are grown as ornamentals (not edibles) for their large size and screening qualities reaching up to 60 feet in height and 30 feet in spread at maturity. It is easily pruned into and maintained in a traditional tree form. Remove all branches, water sprouts and sucker growth from the bottom one-third to one-half of the trunk. Place straight, flat cuts just outside the swollen branch collar on larger branches and flush cuts for small branches or suckers. Refrain from making concave cuts into the main tree trunk as it will delay healing of the cut wound invite disease. Remove any diseased, damaged or dying branches or foliage as you prune, cutting down to healthy wood. Remove each branch as you work before placing the next cut so that your field of vision in the canopy is clear and you are pruning only what must be removed. Shape the canopy of your Japanese blueberry if desired into a pyramidal or rounded shape by pruning the ends of lateral branches. Work around the tree as you prune to ensure a symmetrical and pleasing result. Repeat shape pruning once a year or as needed in the fall or spring. Plant the bush in a frost resistant area. Avoid planting in low areas of your property or areas that remain frozen after other areas have already thawed. Prune your bushes properly each year. Remove short and small diameter shoots and leave longer, thicker branches which are more cold hardy. Keep the soil moist during cold snaps, as moist soil produces more surface heat which helps keep the blueberry plant warm. Begin constant irrigation from above the bushes once temperatures go below 38 degrees Fahrenheit and a frost is expected. Provide 1/10 inch of water per hour, running continuously, until the temperatures rise above freezing again. Stop fertilizing after the blooming period. The excess nitrogen will produce new growth on the bush. New growth is particularly susceptible to winter dieback, which then opens up the plant to disease. Water the plant 1 to 3 inches a week into the fall. This will provide enough moisture for the winter. Stop watering at the end of harvest so the blueberry bushes can go dormant. Place a 3- to 4-inch layer of straw mulch around the base of the blueberry bushes. This will protect the shallow, fibrous root system from extreme temperature fluctuations and frost. Prune the blueberry bushes in late winter--sometime between January and March--when the bushes are dormant. Cut out dead and diseased branches with pruning shears, as well as weak, spindly growth. Remove the oldest unproductive canes to increase air flow through the bush. Choose a spot for your Duke blueberry plants. They need full sun to partial shade in which to thrive. Duke blueberry plants also need well-drained soil. If your soil has too much clay, add sand to improve drainage. Test your soil's pH. Duke blueberry plants need acidic soil in which to thrive. The soil's pH should be between 4.0 to 5.0. If your soil is not acidic enough, add sulfur to increase the acidity of your soil. Add about 1 pound of sulfur per 30 square feet. Plant your Duke blueberry plants in the spring after the last frost. Dig a shallow hole for your Duke blueberry plants. The hole should be wider than it is deep, about 3 feet in diameter and 1 foot deep. Space the holes about 6 feet apart. Place the Duke blueberry plants in the holes. Fill the holes with an equal mixture of peat moss, soil and shredded pine mulch. The top of the Duke blueberry plant's root ball should be exposed by about 2 inches. Apply pine needle mulch on top of the soil mixture to cover up the root ball. Rule out plants over 1 foot in height. As Michigan State University notes, wild lowbush blueberries reach only 1 foot. If your plant is taller, it may be a blueberry bush, but not the wild blueberry. Look at the plant's leaves. Wild blueberry bushes have textured ovoid leaves. They vary in color, ranging from pale green to rust. Bushes may have all green leaves, variegated leaves or a combination. Check for flowers if it's spring, since the plant won't have fruit yet. Wild blueberry plants have small, bell-shaped white flowers. Note any fruit if the plant is not flowering. Unripe blueberries are shiny and green. As they ripen, they turn pink, then blue. Lowbush berries have the classic blueberry shape with the small star at the end of the berry, opposite the stem end. Berries that are blue but lack this star aren't blueberries. Plant your blueberry bushes in a location that has the highest elevation you can and, if possible, does not go below 28 degrees Fahrenheit. Damage can occur below this temperature rating, but a higher planting spot is usually two to four degrees warmer than surrounding areas. Remove any weeds that appear in the soil underneath your blueberry bushes. A clean soil that is firm and moist encourages a warmer climate that helps protect against freezes. Place a plant cover over the tops of your blueberry bushes in midafternoon on days when the lowest temperatures are expected. Covers offer a barrier that help keep the bushes several degrees warmer than they would be on their own. Remove the plant cover once the freeze is over. Water your blueberry bushes more when a freeze is expected. The additional hydration allows the soil to soak up more heat during the day and deliver to this to the bush for cold protection. Prune your blueberry bush immediately after a harvest. This practice encourages bushes to fruit one to two weeks later than it normally would and potentially miss future freezes. Most varieties of blueberry are winter-hardy and can survive temperatures as low as 25 degrees below zero. All varieties, except rabbit-eye, need about 100 nights of winter chilling to produce well. Plant blueberry bushes in full sun in cool or moderate climates, but choose a spot with afternoon shade for areas with hot summers. For hot climates, rabbit-eye varieties are best. Permanently moist but well-drained soil that is high in humus is best for blueberries. The bushes have shallow root systems so they must be irrigated, heavily mulched or planted where the water table is no more than 2 feet below the ground surface. Blueberries need acidic soil with a pH level between 4.5 and 5.5. Acid peat moss, oak leaves, pine needles, wood chips, or pine, fir or oak sawdust all make soil more acidic. Ensure pollination by planting a minimum of three bushes. Plant at least two blueberry varieties for the best results. Buy a sheet or frost cloth large enough to cover blueberry bushes all the way to the ground. Place a thermometer by your bushes so you can monitor the temperature. Gently drape the sheet or frost cloth over the blueberry bush. Make sure there are no gaps where heat can escape. 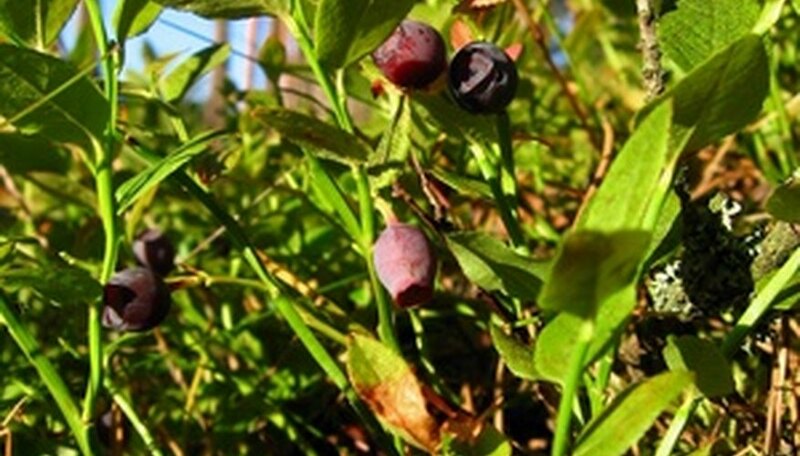 Uncover the blueberry bush during the day when the temperature has warmed up to over 28 degrees F.
Prune rabbiteye blueberry bushes beginning in their second spring. Rabbiteyes need little pruning compared to other families of blueberries, but some judicious culling every spring will keep them healthy and productive. Prune lower branches back to the main trunk to keep the fruiting branches off the soil. This keeps the blueberries from rotting and also discourages some garden pests such as squirrels and possums. Using sharp pruning shears, cut the branch at a 45-degree angle within an inch of the main trunk. Prune any weak or spindly branches, including those that are facing in toward the middle of the blueberry bush rather than outward. Look for branches that are twisted or thin compared to the rest of the bush. Branches growing inward will shade the bush from sunlight that is necessary to ripen the fruit. Cut back vigorous top growth if you wish to keep your rabbiteye blueberry bush at a height that can be harvested by hand. Although the yield will be slightly less, the accessibility of the fruit will compensate for it. Although there are several types of blueberry bushes that grow well in zone 7, rabbiteye blueberry bushes are better for the warm temperatures of zones 7 through 9. It is a high bush variety that has few pests and diseases, unless grown in sopping soil. Then, the plant may contract mummery berry fungus. Though most types of blueberry plants are deciduous, there are three evergreen blueberry plants: Darrow's evergreen blueberry (Vaccinium darrowii), the Florida evergreen blueberry (Vaccinium nitidum) and Andrews creeping blueberry (Vaccinium crassifolium). Select some budsticks from the desired blueberry bush. The budsticks should be roughly the same size in diameter to the trunk of the rootstock and be healthy and disease free. Be sure to check with a local professional cultivator to verify that the varieties are compatible and will produce a healthy plant. Using a razor sharp grafting knife, cut off the top of the rootstock so that the tree is no farther than one foot from the ground. Make a clean, diagonal incision down the trunk roughly one inch long. Make a similar incision on the bottom of the budstick. Match the budstick and the rootstock together so that as much of the center matches as possible. Tightly wrap the entire graft with grafting tape. Allow the graft to heal with the grafting tape in place. New growth should form in roughly eight weeks at which time the tape can be removed. Southern highbush blueberry bushes are more tolerant of hot, dry weather and high soil pH than other types of blueberry bushes. The following varieties produced large crops of flavorful berries at the University of California trial gardens: Bluecrop, Georgia Gem, Misty, O'Neal, Reveille and Sunshine Blue. Withhold fertilizer after June. Resume fertilizing the blueberry bushes in the spring. Cease pruning the blueberry bushes in late fall. Pruning the plants may delay dormancy. Protect the blueberry bush from critters, such as rabbits, that will munch on it if other food is scarce. Construct a chicken wire barrier or netting around the blueberry bush. If the top of the barrier is left open, take into account the normal depth of snow for your area and construct the fence high enough so the rabbits can’t scale it. Mow any grass growing between rows of blueberry bushes to remove possible nesting sites for mice. Combine equal parts of sphagnum peat moss and pine bark mulch and spread a 6-inch layer around the base of the blueberry bush. Pile it up the trunk as well. This will help protect the plant’s shallow root system. Water the blueberry bush in the afternoon prior to an expected frost. Saturate the the top 4 inches of soil. Plan ahead. While making the blueberry potting soil will be simple, gathering all the ingredients will take some time and planning. Compost leaves. This will take some time and you need to be careful when deciding which leave to compost. Oak and pine leaves have too much acidity for most plants but, for blueberries, a little acidity is a good thing. Make compost. The compost the blueberry soil recipe calls for is different than the composted leaves. Compost improves soil fertility and encourages vigorous root development in plants. The organic matter that is found in compost provides food for microorganisms. Gather materials for potting soil. You will need garden soil, chopped, and composted leaves, coarse builder’s sand (unbleached and not sandbox), and compost. Mix composts and soil. Combine the two parts composted leaves and the one part regular compost with two parts garden soil. Add sand. Add one part sand to every three parts of compost and soil mixture. Stir the mixture until it is thoroughly combined. Plant and water the blueberries. Rake away any existing mulch as well as dropped leaves, stems or other debris from around the base of your blueberry bushes, working about a foot out all the way around. Discard these materials. Break up lightly the upper inch of soil in the 1-foot radius around the bush using a cultivator. Don't dig deeply or you may hit the roots of your blueberry bush. Spread a layer of pine needles over the loosened soil to cover it. Pile on the pine needles until the layer is 2 to 3 inches deep. This will take about 1 cubic foot of needles per plant. Inspect under the surface of the pine needles every two months for signs of fungus or disease, such as black, white or yellow tinges in color, bad odors or a slimy appearance. Ideally you will only see a healthy breakdown of the rust-colored needles, which give off an earthy smell. Check monthly if your region has remained overly damp. Rake away and discard any diseased or fungus-ridden needles. Allow the soil to dry for one to two days before applying a new layer of fresh needles. Numerous diseases affect blueberry plants, but proper maintenance reduces the incidences of infections. Choose a site with full sun and acid soil (pH 4.0 to 5.5) that is rich in organic matter and drains well. Apply a fungicidal spray before and during bloom according to the manufacturer's directions to prevent fungal disease. Mummyberry (Monilinia vaciniicorymbosi) causes shoot blight (curled and distorted leaves on shoots) with pink, shriveled berries. Anthracnose (Colletotrichum gloeosporioides) also causes shoot blight, followed by brown or black blossoms and fruit rot. Fusicoccum Canker and Phomopsis Canker are lesions on the stems, which cause the stem to wilt and die. Phytophthora Root Rot causes yellowing leaves and weak growth resulting in the death of the plant. In some cases, the plant may die suddenly. Crown Gall (Agrobacterium tumefaciens) causes galls (knots) in the crown area and on the roots. The plants are usually weak and stunted. Red Leaf Disease causes reddish-brown leaves with white spores on the undersides, while Red Ringspot Virus causes reddish-brown spots only on top of leaves. The leaves of a plant infected with Shoestring Virus are strap-like and twisted, and there may be narrow reddish streaks on the stems. Leaves are small and cupped with yellowish margins in plants affected by Stunt Virus. Mosaic Virus causes the leaves to be mottled green and yellow. There is no treatment for most leaf diseases on blueberry plants. The plants have to be removed and burned. 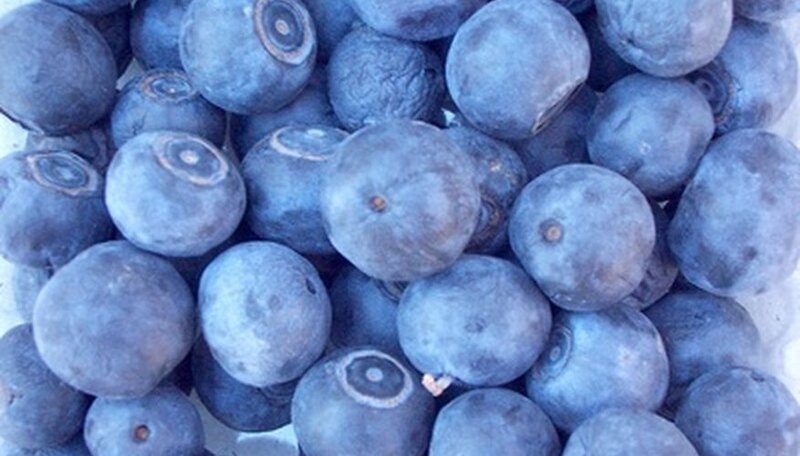 The three primary types of blueberries are the highbush, the rabbiteye and the Southern highbush. There are many popular highbush varieties, including the Herbert blueberry, the bluejay blueberry and the bluecrop blueberry. 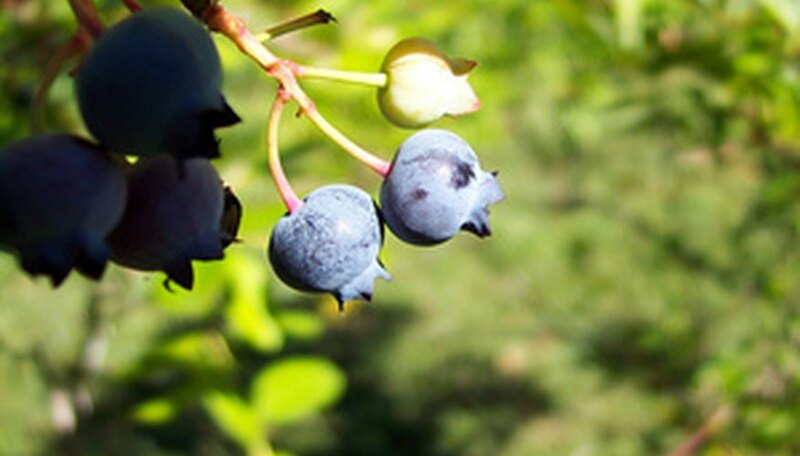 Blueberry bushes start producing fruit in the third season, but aren’t fully productive until the sixth. The blueberry fruit is ripe when it has turned a deep blue and pulls away from the cluster. Blueberry plants need free-draining, highly acidic soils rich with organic matter. The planting location should be fully sunny for optimum fruit quality and yield. Blueberry plants have shallow root systems that need at least 1 inch of water every week. Peat moss or sawdust mulches help conserve moisture, control weeds and increase nutrient intake. Blueberry bushes typically don’t need any pruning for the first three seasons. Dormant blueberry plants should be pruned in the spring of the fourth season to stimulate growth. Potential blueberry plant diseases include powdery mildew, mummy berry, botrytis blossom blight and leaf spots. 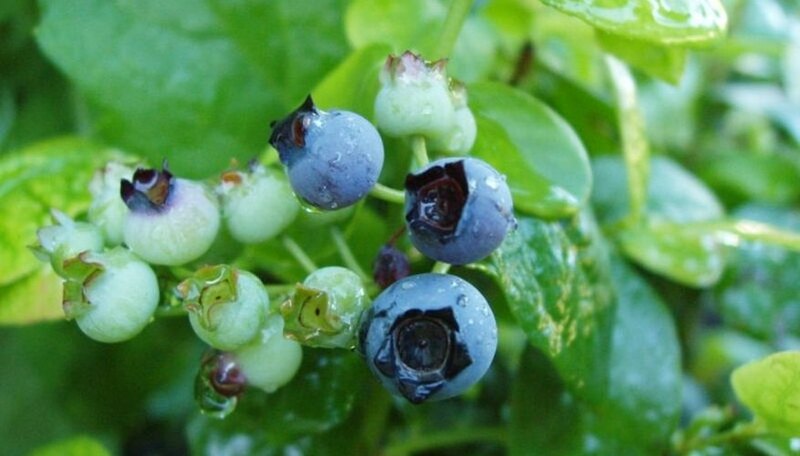 Blueberry bushes are vulnerable to attacks from blueberry tip borers, cherry fruit worms and cranberry fruit worms. Pick a planting site a minimum of 7 feet from the raspberry plant for your blueberry plant, with proper sunlight requirements. Do not add manure to the planting site as you would raspberries, as blueberries are not used to alkaline soil and manure is alkaline. Dig a large and deep enough hole in the ground for blueberry transplant's root ball, with an additional 6 inches in diameter. When planting blueberry transplants, spread out the roots with your hands gently and set the transplant into the hole. This will ensure the roots don't get cramped and will let them spread out naturally. Mulch around the base of the blueberry plant to retain water near the roots. Blueberry plants need this because the transplants will need more water as they establish. Water right after planting, and after that, water enough to keep the soil moist but not soaked. Keep the acidic content in the blueberry soil high with aluminum sulfate and peat moss. Raspberry plants do not need this additional amendment, so it is common for the raspberries to grow faster than usual. Because of this, prune the raspberry bushes more regularly than the blueberries so they don't overpower the blueberry plant. Boost soil fertility for your blueberries by adding significant amounts of compost and well-aged manure into the soil. Add several pounds of each for each bush at planting time, or scratch it into the soil's surface in the early fall. Amending the soil with these organic elements will increase its richness and nutrient value. Amend the soil to boost its acidity. Add roughly 1 lb. of peat moss to the soil for each bush at planting time, or scratch it into the soil's surface after planting. 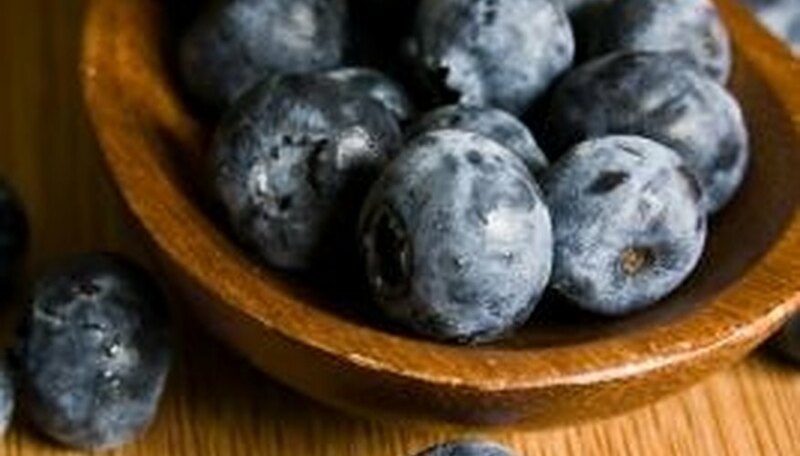 Feed your blueberries with an organic fertilizer in which the nitrogen component is derived from ammonium sources such as fish emulsion or fish meal. Apply in doses and at seasonal intervals according to label instructions. Mulch around the base of the blueberry bushes with a 3-inch blanket of organic mulching material each year. Mulching helps retain moisture in the soil and boosts the soil's nutrition as the mulch degrades over time. Use leaf mold, shredded bark or cocoa hulls as mulch materials. Blueberry plants, a small, popular fruit found growing in the United States, begin to produce fruit in its third season, but do not become fully productive until the sixth year. Late winter, when the branches are still bare, is the best time to prune your blueberry bushes. Pruning helps the plant give a better fruit crop. All blueberry plants require acidic soil with a pH ranging from 4.0 to 5.5. Soils with high pH benefit from an application of elemental sulfur. Soils lower in pH need an application of dolomitic lime. To thrive and produce quality berries, blueberries sometimes need individual fertilizer elements such as nitrogen. For the home garden, an application of nitrogen often takes care of all of the plant’s needs. Some gardeners add phosphorus before setting the plants in the ground. Calcium and magnesium come in handy to correct any soil deficiencies. A complete, balanced fertilizer of 16-8-8 works well when applied to young, individual plants. Balanced fertilizer formulas that contain 4 percent added magnesium also give the plants the nutrients they need. Applying fertilizer by hand or via an applicator suffices for older plants.